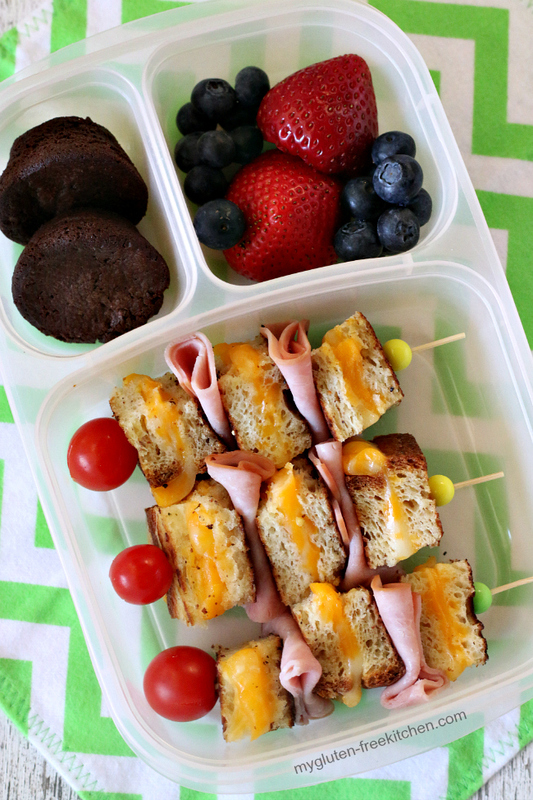 Fun for the lunch box, these gluten-free grilled cheese kabobs are easy to make and easy to customize. 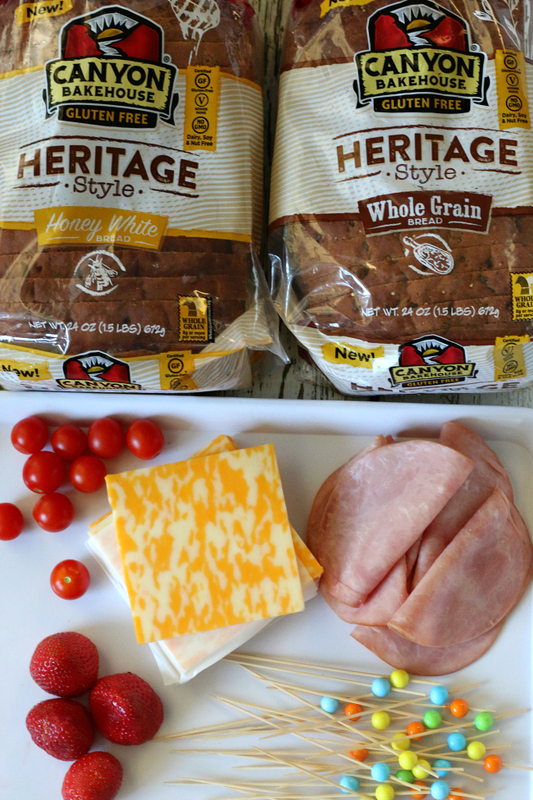 I used slices of gluten-free Heritage loaves from Canyon Bakehouse, so they’ve sponsored this post! Want to know what my favorite store-bought gluten-free bread is? Canyon Bakehouse Heritage Loaves! I first tried these out in January when Canyon Bakehouse sent me them as part of their launch. The first meal I made with a loaf was these gluten-free triple meat sandwiches that my family loved! Since then, we’ve had French Toast, toast with peanut butter, PB&J, ham sandwiches and many grilled cheese sandwiches on loaves of Canyon Bakehouse Heritage Bread. I love that it’s full size loaves of bread so buying it isn’t a waste of money! One day when I made grilled cheese sandwiches for my family, I had the idea to switch them up a bit. My idea was to cube them up, let them cool, and put them on little skewers with ham for kabobs that would fit in their lunchbox. I tried it out that day with my boys and they loved them! 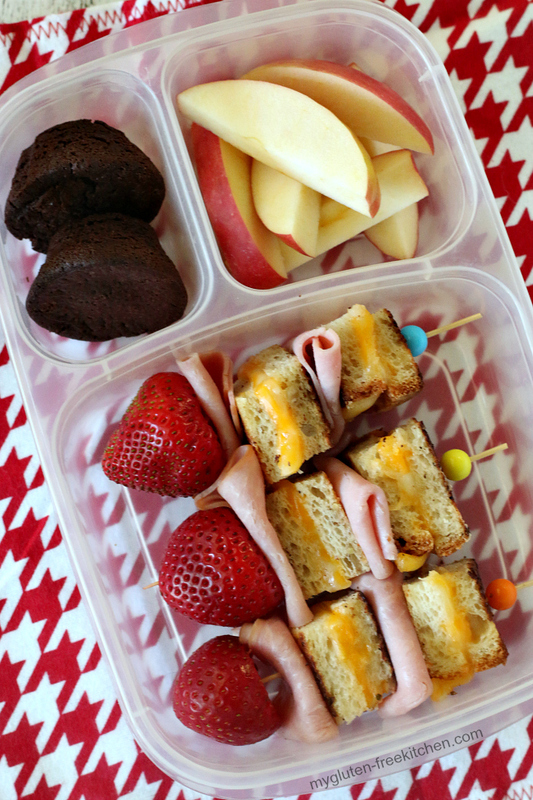 They were a fun change from the usual lunch box ideas. You can even make these the night before. My youngest is not a fan of tomatoes at all, even our homegrown sweet cherry tomatoes, so he asked for strawberries on his. I figured why not?! He just pulls it off and eats it first! I’ve heard of people putting jam on their grilled cheese sandwiches, so this is kind of similar anyhow! The bread: Canyon Bakehouse gluten-free Heritage Style Bread. I used both the Honey White and the Whole Grain in these. Cheese: I opted for Colby Jack, but a good cheddar is so good too! Deli ham: I sliced the deli ham into half slices that I then folded twice to put on the skewers. If your deli ham slices are large, you’ll want to cut into quarters. Garlic Butter: It’s the secret to the best grilled cheese sandwiches! I buy garlic butter already made, but you can make your own easily by stirring garlic powder and a little salt and parsley into softened butter. Or just use regular salted butter. I included some Canyon Bakehouse gluten-free brownie bites as a sweet side in their lunch boxes too. My kids really like these and I’m okay including a small treat a few times a week. Once you pick up your loaf of Canyon Bakehouse Heritage Bread, here are a few other recipes from my fellow bloggers that you can make with those loaves. This gluten-free turkey, gouda and apple sandwich looks like an easy and healthy lunch! My meat loving family would love this Big, Buff, and Cheesy Gluten-free Sandwich for lunch or dinner. I’ve never had a Fluffernutter sandwich but this Gluten-free Fluffernutter Sandwich looks like a fun sandwich to try soon! Hope you and your kiddos enjoy these! 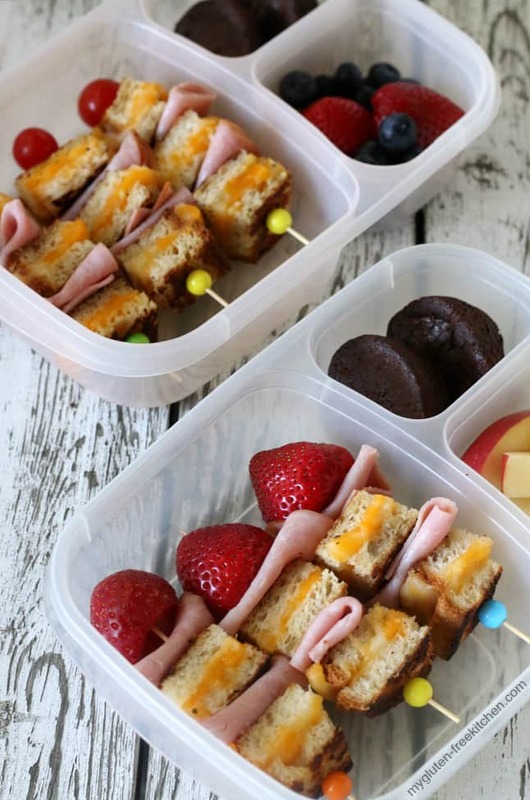 Fun twist on the usual sandwich, these gluten-free grilled cheese kabobs are an easy, kid-friendly lunch idea. Spread softened garlic butter or salted butter on the top side of the sandwich. Melt remaining garlic butter or salted butter on one side of skillet over medium heat. Place unbuttered bottom of sandwich on the melted butter. Cover pan with a lid. (Steam helps the cheese melt without burning the bread). Remove lid after two minutes to check bottom of sandwich to watch for browning. Once brown, flip sandwich over and repeat cooking with lid on until other side is brown as well. Remove from skillet and place on cutting board to cool. Once cool, use a knife to cut grilled cheese sandwich into cubes. I cut it into three rows, then cut into about 1" cubes. One sandwich resulted in 14 cubes. To assemble skewers: Alternate grilled cheese cubes with 1/2 slices of deli ham on skewers. Add cherry tomatoes or strawberries at the end(s). Refrigerate or place in lunch bag with ice pack to keep cool until lunch. This sponsored post was created through my partnership with Canyon Bakehouse. As always, all opinions are my own. Collaborating with brands I love allows me to keep bringing you new and varied recipes! Thanks for your support! How do they taste if you make them in the morning and the kids eat them at lunch time? My kids always complain the bread doesn’t taste good and it’s not hot and soggy.